Oops, I know how excited you are to join but allow me first to share with you all the tings that I am grateful for. I forgot when did I got my domain (age factor?) but just in case I won, it would be great to have my blog hosted and undergo a total makeover! weee.. so exciting indeed! And so, what are those things that I would be thankful for? ♥Third, I thank God's unfailing love and faithfulness. I know I have lots of shortcomings and failures but yet His love is so overwhelming. ♥Fourth, I thank God for giving me a mentor, boss and real friend in the person of my two bosses (Sir Cesar and Sir Melo). I am thankful to God for using them as an instrument in opening great opportunities for me. ♥Fifth, I thank God not only for my own family, but for my external families as well as my Lighthouse Iponan whose love and encouragement is undeniable. ♥Sixth, I thank God for God's provision that has yet to come in preparation for my Big Day! God has been so good to me that amidst tears and well, sometimes frustrations, He always lifted me up. In totality, I thank God for everything! 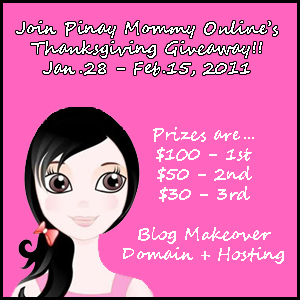 If you want to join in this fabulous giveaways, visit Pinay Mommy Online's Thanksgiving Giveaway post.